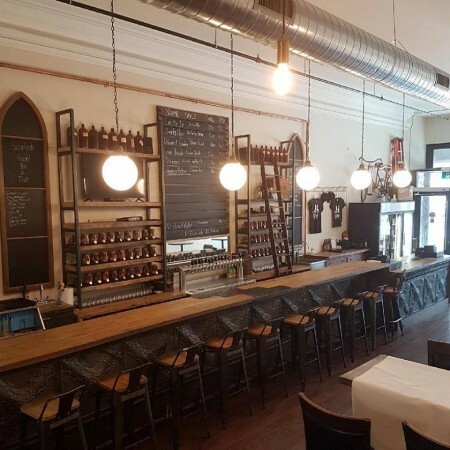 GUELPH, ON – Brothers Brewing has announced that its Brothers Ale House taproom and retail store in Guelph’s iconic Petrie Building will be opening to the public today (June 13th) for the first time. Founded in 2014 by twin brothers Asa and Colton Proveau, who were later joined by partner Michael Bevan, Brothers has been operating on a contract brewing model while a brewery location was found and renovations and construction took place. Located at 15 Wyndham Street North, Brothers Ale House will be offering draught and bottle sales of various beers including Tropic Thunder Pale Ale, Berliner Wiesse, Space Beer Black IPA, and more. The venue also includes a kitchen that will be operated by Little Mushroom Catering. Brothers Ale House will be opening today at 4:00 PM. For more details, see the Brothers Brewing website and Facebook page.